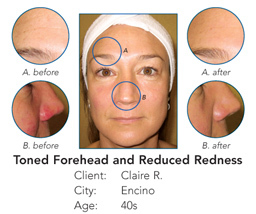 The impressive results of Energy Light Rejuvenation™ are shown in these un-retouched photos. The results below occurred after ONLY 7 SESSIONS! Carmen suffered from cystic/severe acne for many years. Since beginning her Energy Light Rejuvenation treatments, she has not had one breakout. 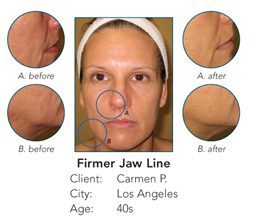 In addition to her acne relief, there is visible firming in the jaw line and around the nasal labial folds. Carmen also saw an immense improvement in the tone and texture of her skin. She feels as vibrant as she looks! Claire has rosecea and was a smoker for several years. For Claire, the results were immediate. The lines on her forehead and around her eyes virtually disappeared. Her lips became fuller. The rosecea became less inflamed and the tone and texture of her skin significantly improved. Like many of us, Claire lives a very stressful and busy life. She found the Energy Light Rejuvenation treatments to be very calming and relaxing. And, as a side note, Claire’s husband noticed such a change in her appearance that he has inquired about the treatments for himself!